Sun in Scorpio’s focus on absolute commitment will blend nicely with Moon in Cancer’s need to feel safe. Scorpio will probably dominate this relationship, while acting as protector to his Cancer partner. Both these signs are incredibly private, so this relationship may become insular; outsiders will be viewed with suspicion. Sun in Scorpio is uncompromising about his privacy. He has a rep for keeping secrets (even from his lover). 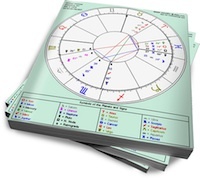 Knowledge is power for Sun in Scorpio, and he considers every bit of insight a valuable bargaining chip. This is why he is so canny about personal revelations, while probing others for their private information. For his partner, this constant emphasis on full disclosure versus suspicion can be draining. However, a healthy Scorpio in full trust mode makes a fiercely loyal, profoundly intimate lover. But Shadow Scorpio may manifest as a jealous, manipulative and controlling partner who uses intimacy as a weapon. Moon in Cancer needs to feel protected. She also needs to nurture, but she will not open up if she doesn’t feel secure first. Initially cautious, Moon in Cancer will become a healing combination of caregiver and lover (once her partner has gained her trust). Her full-on emotions, shifting moods and (sometimes) smothering brand of love is only for those who aren’t scared off by intimacy. Shadow Cancer can emerge as the child with a bottomless hunger for love and security. Sun in Scorpio will instinctively trust Cancer, because he’ll sense a kindred soul who values privacy (and who isn’t scared off by intensity). He’ll take on the role of guardian, and Moon in Cancer will feel safe. Scorpio will be strong enough to take Cancer’s mood swings in stride, and Cancer will give him as much (if not more) intimacy as he demands. Together, they’ll create an intense, closed circuit of care and emotional sustenance.